A couple of days ago, I received an e-mail from my cousin stating that he and his kids were going to be marching in the Macy’s Thanksgiving Day parade. I knew I wasn’t going to be able to see it live, so I DVRed it for later. My kids, however, love watching parades and were able to see it live. NHL said he was able to spot my cousin’s kids. Upon watching the DVRed footage, though, I couldn’t spot them, but I was able to spot my cousin (dressed as a hockey referee). 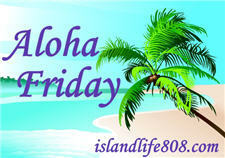 My Aloha Friday question for today is: Did you watch the Thanksgiving Day Parade?